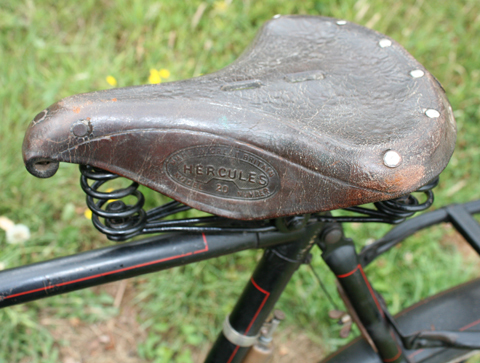 I bumped into the Hercules marque specialist as I was viewing this delightful old Hercules at a collectors’ bicycle auction. We were both interested in it, but also both interested in a Lady’s Centaur. So we agreed who’d bid for what and I duly ended up with this Herc. It wasn’t cheap – there were plenty of other enthusiasts at that auction with good taste – but it’s in wonderful original condition …and just what I wanted as the flagship Hercules for my Online Hercules Museum. One advantage of buying a cycle in the company of the marque specialist is instantly calculating its age. As you can see from the 1930 Hercules catalogue elsewhere on the Hercules Museum website, the range was completely redesigned for 1930. The most obvious visual indicator is that from 1930 the crossbar-mounted gear shifter was no longer fitted (except for the Model G All-Black with full chaincase). We both reckoned this to be a 1929 model. Not only is the Hercules emblem intact on the headstock and in superb condition, but it also retains its original dealer transfer. The supplying company was Bells Motorcycles and Cycles, of 70 Lower Bristol Rd, Bath. With all its pleasant aspects to take in, I didn’t even notice the cylometer until I got it home. 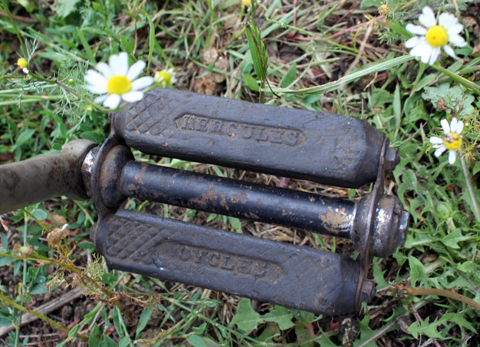 The original nickel-plated fittings and handlebars are in superb condition. The black enamel has its original box lining. 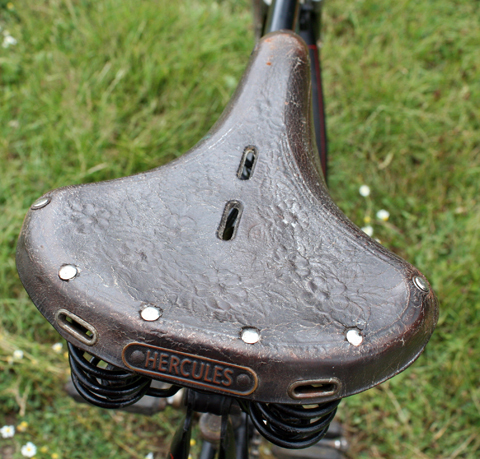 Subsequently I managed to find original 1920s Hercules pedals and saddle, which are now fitted onto the bike. 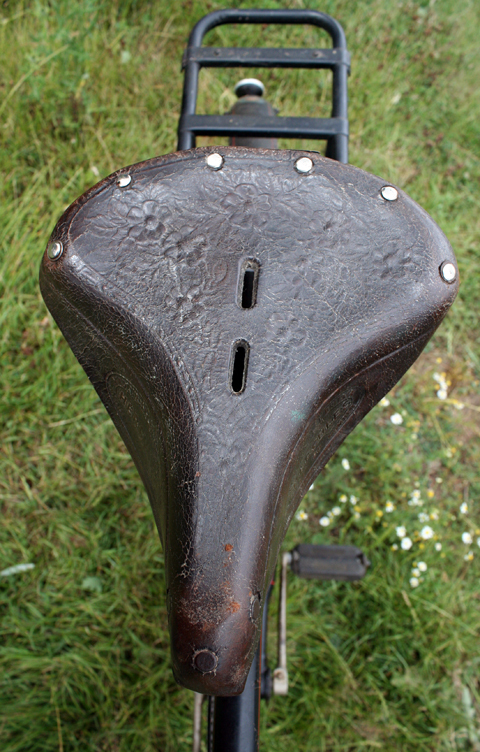 The top of the saddle is inlaid with a daisy motif. The rear hub is a three-speed KK Sturmey Archer. 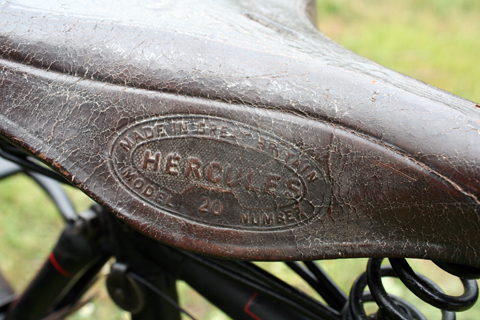 When I took off the old saddle to fit the Hercules one, I looked inside the Brooks saddlebag for the first time. The bad news was that the bag fell apart; the good news was that there was a complete set of tools inside, including a pedal spanner so I could install the Hercules pedals.